The predicted overnight snowfall came down as rain and froze to create a hazardous sheet of ice upon the roads and pavements this morning, and the cars were driving slowly to avoid skidding as I made my way, one wary step at a time, towards the market in the bitter cold. Once I got there I was greeted by a crowd of people who, like me, were taking the last opportunity to buy a tree - and Denise who was cheerfully swinging the mistletoe around. 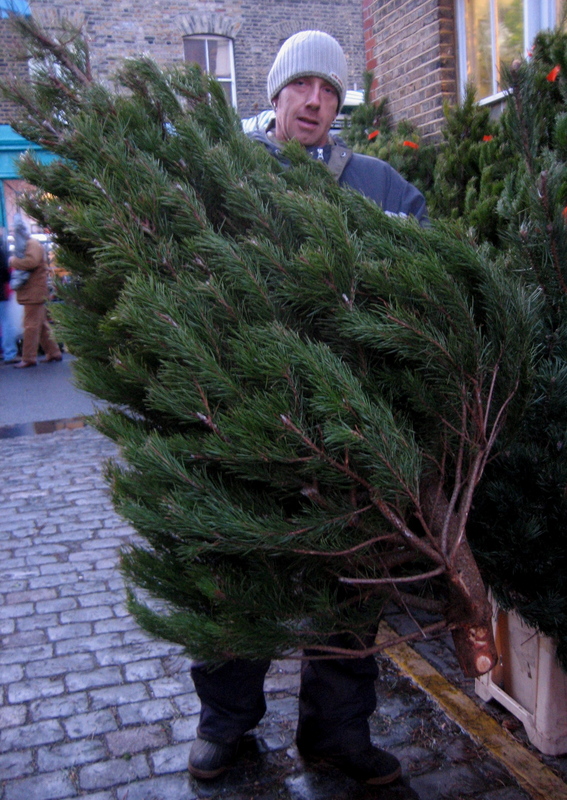 Last year, I made the big mistake of thinking that if I got to Columbia Rd at the end of business on the final Sunday before Christmas, I could get a massive tree at a bargain price and carry it home in triumph. In fact, there were hardly any left, I was left with a disappointing choice of a few puny leftovers and had to make do with the best of the bunch. This year, I was there early in the day and after momentarily deliberating between Scots Pine and Douglas Fir, a plumed Scots Pine caught my eye – not an ostentatiously large tree but a fine shape and colour. Mark sold it to me for £25, I carried it home in quiet satisfaction and now the house smells of pine. Do you remember the Blue Hyacinths I bought back on November 1st to complement my grandmother’s blue Spode bowl that she always planted with bulbs? As you can see, they turned out pink. She would have admonished them for their insufficiency in not being true blue, and say they look like hideous pink plastic swimming hats – but it is merely a question of taste. If I recollect correctly, pale pink is the natural colour of Hyacinths, that I once bought years ago from gypsies in the streets in Transylvania, where they grow wild in the Carpathian mountains. 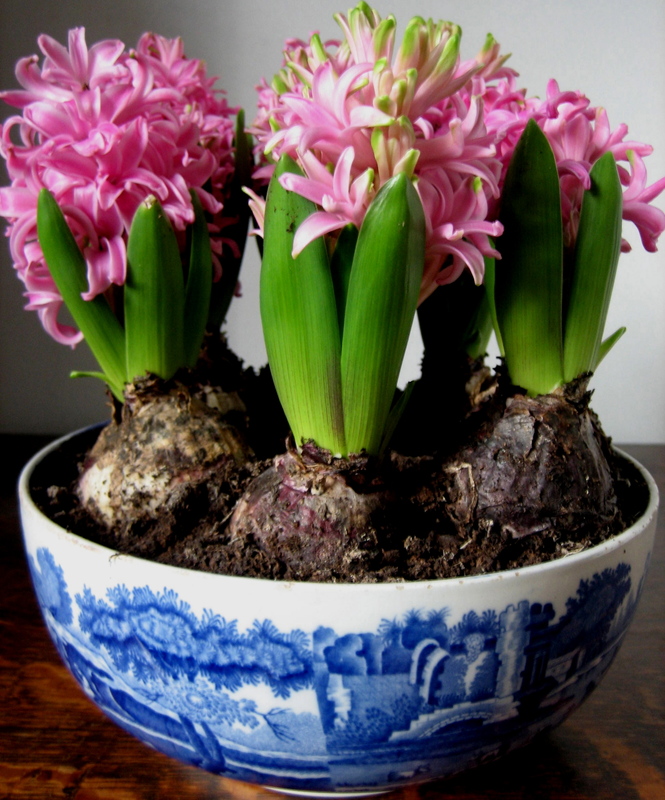 This week, whenever I have come into the house out of the grim cold weather, these pink Hyacinths have welcomed me with their unashamedly vibrant lush flowers that never fail to lift my spirits, how could I be disappointed with that? There is always such a precarious balance of huge expectation and potential disappointment at Christmas, and it is a delicate equilibrium to preserve.